Sierra Nevada Corp. has conducted a free flight test of a spacecraft designed to deliver cargo to and from the International Space Station under NASA’s Commercial Resupply Services 2 contract. 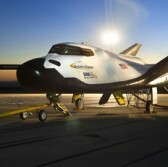 The Dream Chaser test spacecraft was air-lifted by a Columbia 234-UT Chinook helicopter before the space vehicle performed a pre-planned flight and autonomous landing operation at Edwards Air Force Base in California following its release mid-flight during the flight test Saturday, the company said Monday. Mark Sirangelo, corporate vice president of space system business area at SNC, said the flight test sought to demonstrate the space vehicle’s aerodynamic design. SNC will perform at least six cargo flights to the ISS as early as 2020 under the CRS-2 contract awarded in January 2016. NASA and the company will assess data from the approach-and-landing test, such as the space vehicle’s integrated system and aerodynamic performance at an altitude of approximately 12,400 feet through nose and main landing gear touchdown. Dream Chaser is a reusable spacecraft designed to land at Kennedy Space Center in Florida. SNC developed the test vehicle through the Commercial Crew Integrated Capabilities agreement and performed the free flight test three months after it conducted a captive carry test in August.